My husband and I are lucky enough to have wonderful friends and family who brought us all kinds of meals after we had our daughter. But eventually, the meal train literally ran out. Luckily, I was prepared. About a month before Lacy James was born, I invited my mom down to Nashville and we spent an entire weekend making freezer meals to stock up for after the baby was born. For this challenge, I recreated one of the dishes we made with the help of my new sous chef, Lacy James! She is great at holding (eating) measuring spoons for me. 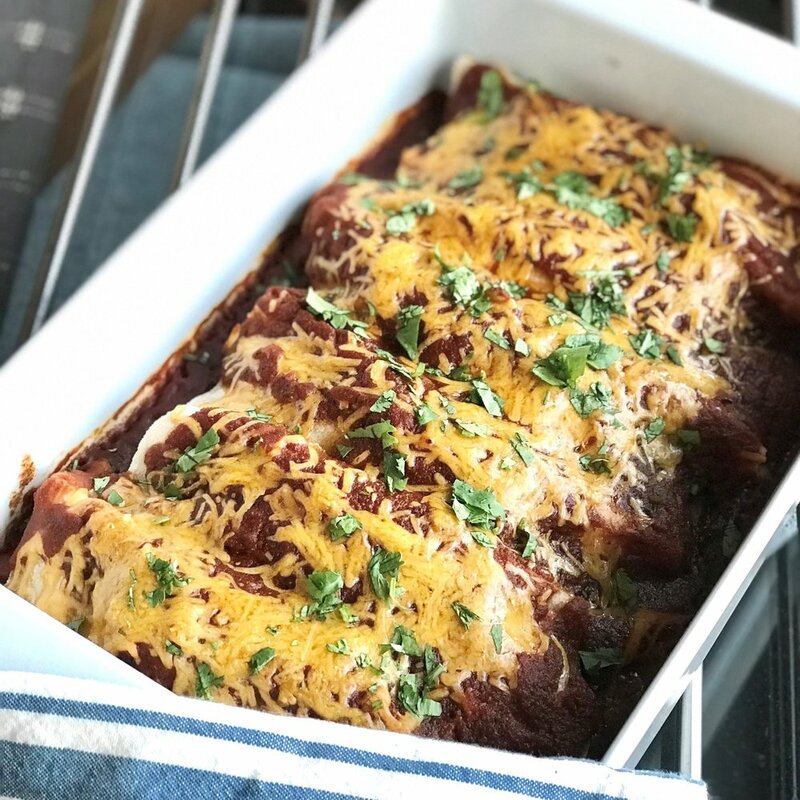 One of my favorite meals that we made were chicken enchiladas; the version we made was healthy and filling, and the perfect quick meal to warm up on nights when we had no time to cook (aka every night). 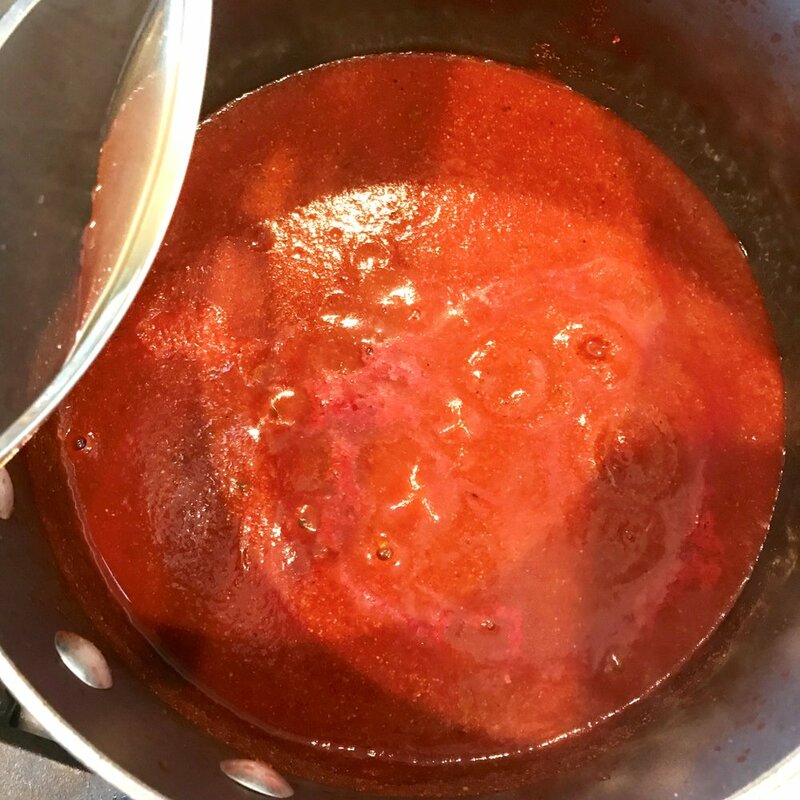 The base for this dish is my favorite spicy enchilada sauce. I use it not only for this freezer meal, but I also keep it around to toss in the Crockpot with chicken or pork—or you can toss in your favorite veggies. Find the recipe for this one-pot, quick enchilada sauce on my Web site, by clicking here. 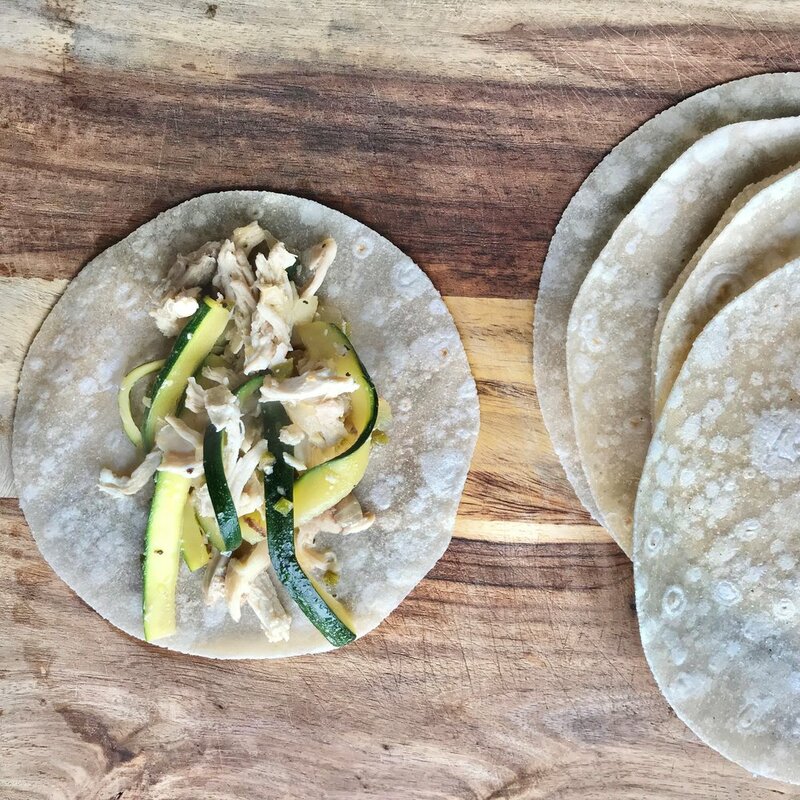 For the filling of my enchiladas I love using chicken and any veggies I have in my freezer—bell peppers, mushrooms, onions, zucchini, etc. This time around I used chicken, zucchini, onion, and jalapeno. The best part of making the freezer meals was being able to spend an entire weekend in the kitchen with my sweet momma, making some delicious meals. I hope you enjoy! Pour the olive oil into a large sauté pan, then add the onion and jalapeno; cook on medium heat until the onions begin to look transparent. Add the zucchini and cook until it begins to soften—about 3 to 5 minutes. Next add the chicken stock, salt, pepper, and garlic powder, and cook for another 3 to 5 minutes. Toss in the chicken and stir all ingredients together. To assemble, make sure to first wrap the tortillas in a wet paper towel and microwave them to prevent them from cracking when filled. Spray a baking dish with non-stick cooking spray, fill each tortilla, then roll them up and place them in the baking dish. When the enchiladas are all filled and in the pan, pour the sauce on top and sprinkle the enchiladas with cheese. If you are looking for a dairy free option, feel free to leave the cheese off—the sauce does all the work! To reheat, remove the enchiladas from the freezer the night before you plan to eat them. When you are ready to eat, cover the baking dish loosely with aluminum foil and cook the enchiladas in an oven preheated to 350°F until the center of the dish reaches 160°F—15 to 20 minutes.